Warner Bros. Home Entertainment and DC announced today that four Batman titles will be released on 4K UHD to celebrate the 80th anniversary of the DC Super Hero created by Bob Kane and Bill Finger. The films include 1989’s Batman and 1992’s Batman Returns, directed by Tim Burton, and 1995’s Batman Forever and 1997’s Batman & Robin, directed by Joel Schumacher. The four films, which earned more than $1.2 billion in global box office, have been remastered in 4K UHD for the first time. The 4K Ultra HD Blu-ray and Blu-ray discs of Batman, Batman Returns, Batman Forever and Batman & Robin will feature a Dolby Atmos® soundtrack remixed specifically for the home theater environment to place and move audio anywhere in the room, including overhead. To experience Dolby Atmos at home, a Dolby Atmos enabled AV receiver and additional speakers are required, or a Dolby Atmos enabled sound bar. Dolby Atmos soundtracks are also fully backward compatible with traditional audio configurations and legacy home entertainment equipment. 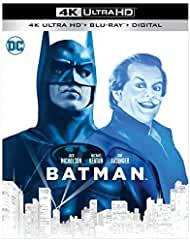 On June 4, Batman, Batman Returns, Batman Forever and Batman & Robin 4K UHD will be available to own for streaming and download to watch anywhere in high definition and standard definition on favorite devices from select digital retailers including GooglePlay, Vudu, Xbox and others, and will be made available digitally on Video On Demand services from cable and satellite providers, and on select gaming consoles.